Warrior Witch is the final book in The Malediction Trilogy. With the witch Anushka dead and trolls finally freed, the isle is at war. Tristan and Cécile, are finally together again after being separated but they have no time to celebrate. They quickly find themselves fighting a war on two fronts and if that were not enough, each of them owe a life debt to the fae. Somehow, they must find away to stop Tristan's violently insane younger brother from claiming the throne, as they try to stay one step ahead of the fae, who clearly have been playing the long game. Cécile has been through much since we were first introduced to her in Stolen Songbird. My first complaint with her character was the she turned out to be the typical spunky agent and this still has not changed. I am well aware that this book YA and therefore a younger protagonist might make mistakes that a more mature one might not but I don't think it's unreasonable to expect some character growth, of which Cécile had absolutely none. Cécile constantly vacillated between wallowing in self pity due to the consequences of her actions and in turn blaming others and shirking responsibility altogether. What was perhaps must irritating about Cécile was her absolute refusal to listen to others. The trolls on her side of the war were experienced and trained and time after time, she ignored their advice to do things her own way which inevitably further complicated whatever situation she was trying to extricate herself from. The thing that bothered me most about Cécile as a spunky agent is that her actions didn't even make sense. Who exactly decides to sneak into the enemies lair in the middle of the night without bothering to inform friends and family of the risk they are taking? Cécile that's who. She knew damn well that cooler heads would have forced her to think through her actions and so she ran off instead with a half formed idea. When called upon her action, Cécile didn't even seem to want to acknowledge that her friends and family were terrified that she had died. She's almost bitter about having to take her lumps for their rightful anger. Warrior Witch is filled with action which for me is a bit of a turn off. I don't enjoy reading battle scene after battle scene and the writing in these portions of the book was far from descriptive enough for me to be drawn in. Instead, it felt like the action was drawing out the inevitable conclusion of the story. There just wasn't enough meta holding Warrior Witch together for me, even with the introduction of the fae and an explanation as to how they become trolls and trapped on earth. The introduction of the fae should have added something special to this story and yet, I felt at least the Winter Queen was far too easily defeated to be of much interest. If that were not enough, solving the mystery of how the Trolls became trapped on earth on the first place occurred in what felt like a blink of the eye. How is it that the Trolls and witches have been trying for centuries to deal with the iron poisoning which trapped the Trolls on earth and Cécile was able to put together a little spell in a New York minute? I understand that Cécile is the super special chosen one but watching her vacillate between an utter wreck and then completely competent threw off the flow of the story. For all its faults, I read through Warrior Witch rather quickly. I kept hoping that it would return to the former brilliance of Stolen Songbird, only to be bitterly disappointed. At least part of the problem is that Tristan and Cécile spent so much time apart and on top of that, for a time, Tristan used magic to shut down his feelings so he wouldn't be tempted to rush to her aid. This series really needed the banter between Cécile and Tristan to be at its best. I kept reading in spite of what was wrong because I wanted to see how Jensen ended this trilogy. I know that many of complained about the ending because Jensen didn't wrap it up in a neat little bow and make it pretty but for me, it was the best part of the story. After Cécile's actions caused so much death and so much pain, I don't think it would have been right if she had been able to simply ride off into the sunset with Tristan in a state of bliss. Everyone experienced some form of loss and I didn't think that Cécile should be any different. The ending finally gave me the smallest glimpse of what Cécile became after the folly of youth was far behind her. In a way, it was the redemption that her character needed, I'm only sorry that Jensen didn't build upon this more. In spite of Cécile, the world that Jensen created for this trilogy was great. I loved seeing a different side to trolls and the magic that they were able to use. The idea of this gorgeous underground world filled with intrigue, political uprising and murder had moments of real brilliance. What I cannot understand is why for all of the creativity Jensen employed creating The Malediction Trilogy that she chose to create ended up being all White, Straight and Cisgender. Unfortunately, disabled people were not erased in this series. It's never a good thing when you find yourself actually wishing for erasure. The iron in the world makes the Trolls sick and mortal. For many trolls this illness results in a reduction of power and violent mental illness. Roland is an eight year old boy and Tristan's brother. Not only is Roland mentally ill, he is extremely violent and spends most of this trilogy functioning as a weapon for someone else. He doesn't want to kill his mother, father or brother but he does so because he is compelled. Even in his moment of calm when he tries to convince Tristan to abdicate the throne, Roland still wants to paint the world read with blood. It's an indication of just how wedded Jensen is to this ableist trope that Roland, the mentally ill and violent child was so much more mature than her spunky agent protagonist. As aforementioned, Warrior Witch is the last book in the trilogy. I absolutely don't recommend picking it up if you haven't read the first two books, or if you have forgotten the plot line of the first two books because Jensen doesn't take any time recapping her previous stories or how characters are connected to each other. 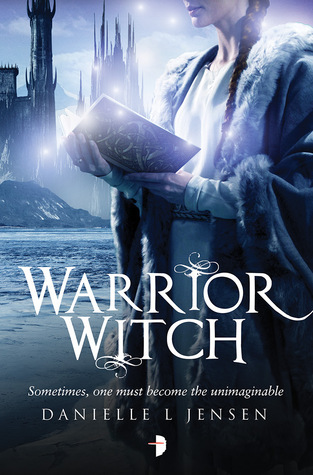 Warrior Witch does what a third novel in a trilogy is meant to do - it finishes the story. There isn't a lot of flash or epic moments despite the high level of action. If anything, it feels like the final letdown in what started off as a brilliant series. Read it if you must but you might be happier if you just read the first novel in this series and stop right there because I promise after that, you've left the best of The Malediction Trilogy behind you.